Some days ago at the Maker Convent Barcelona we had the opportunity of gathering 25 creative minds from different backgrounds, interested in the co-creation of new applications and 3D printing related projects based on Europeana content. It was the first of four “pre-events” before the Europeana Creative Culture Jam that will take place the 9th and 10th of July in Vienna at the Austrian National Library, as the final showcase event of the Europeana Creative project. The day was very intense, as it had the goal to co-create and foster the development of prototypes (such as mobile/web application mockups, ready-made physical products, 3D printed objects or new services) that promote and reuse digital heritage content from Europeana. 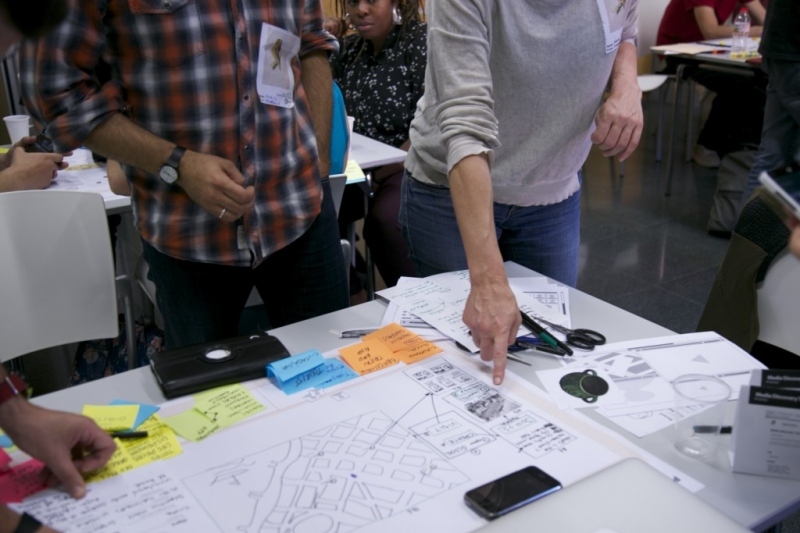 The workshop, facilitated by Platoniq, brought together different participants sharing ideas and designs, inspiring one another and testing new ways of integrating digital heritage into new concepts. As we began, a lot of ideas came up and were sketched throughout the session, and scenarios were brainstormed and framed in specific areas of interest. Within the group of participants in the #CultJam15 there were different kinds of profiles that focused on specific areas, such as heritage related to jewellery and fashion, education processes, architecture (from geolocating content to structural-constructive elements) and 3D print-enthusiasts. We focused the Workshop on separating the co-creation into clear, step-by-step phases, which were very enriching as the day advanced. The introduction helped to give an overall view of the type of content that participants could find, so they knew about the material that is freely available for re-use via Europeana, exploring with tools like Culture Cam or other data collections available via Europeana Labs. We commented on projects such as our eCreative Pilots or the awesome concepts behind our Challenge winners in Education , Social Networks and Tourism , and Design. Also, thanks to a previous informal meeting held the day before, we were able to bring specific projects and inputs shared by the participants that had a direct relationship with digital heritage, in multiple media formats. 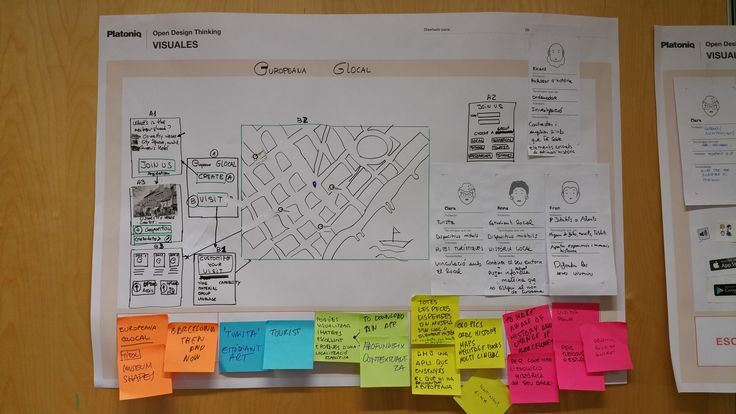 After this first introduction to eCreative’s context, we focused on the “hands-on mode” in which to bring the makers “vibe”, so we could open up the creativity process for our potential users of Europeana. The participants classified themselves as “Institution / Provider of Content”, “Designer / Artist”, “Content Diffuser / Enthusiast” or “Programmer / Developer”, and the teams organized freely yet overall they ended up multidisciplinary. Throughout the exploration of the first ideas, the groups organized diverse scenarios in which content and user needs assembled and adapted to summarized areas around 3D, apps and others that could emerge. We knew that getting something meaningful done within such a short amount of time could be stressful, but we encouraged everyone to take a break every now and then to relax and enjoy the event. This concept, based on the needs of the professional sector of jewellers as well as on the idea of recovering old and simple techniques from heritage collections, pointed to the opportunity of having different sets of images of a given old clasp (open, closed, detail, etc). The idea reflects the need to have some dimension, category or section around Europeana for functional objects, caring about specific needs in terms of metadata and quality, resolution, and level of detail of objects and its corresponding images. The co-design developed in this case covers the animations and even 3D models which would help to inspire works as a reinterpretation of new technical solutions for creating bracelets and similar pieces according to curated collections, and also a refined search for this type of specific content. The idea comes as an app that may tackle the inclusion of new techniques of cultural-heritage interpretation through city monuments. These new techniques are focused on groups of users, tourists that visit a city, who are blind or deaf (as hearing-impaired) as giving an extensive, accessible context to Europeana’s content. It has two type of materials on site. On the one hand, digital files geolocated at the actual monuments throughout the city that can be accessed from mobile devices. The proposal is to use sound-guides or narrated explanations for a blind person, and as visual videos for a deaf or hearing-impaired. On the other hand, tactile models of the most remarkable elements of the site. This 3D modeled objects are from the architecture or specific details (decoration or objects related) and also provide a short explanation in Braille. To add an extra layer of participation, the project involves educators to develop extra content, as to the actual user, in which they can record their experience and share it with other participants. This concept brings in a new way of understanding digital content, which can work on a shared global context but has a focused, local impact. The intention is to create an app which sets the profile of users as Content-editor and Visitor. The tools given by the app try to help to geolocalize existing content at Europeana (Content-Editor), allowing visitors to search/browse through GPS locations where they can check heritage material available by ‘radius’. The functionalities from one type of user to another is set as the user enters the app and chooses the profile they want. From the Content-Editor profile, the app could give access to edit tools connected to the Europeana database in which they can fill the geo-tagging into different materials. They can also prepare guidelines for future tours around specific elements (say, Roman Barcelona can relate to Roman objects, architecture, plans, text, etc). The Visitors profile gives the user access to enhanced material and adds a search tool based on their location, and they can actually filter by their own preferences. Parameters as areas of interest, group of providers, subjects, the type of content (audio, 3D, text, images…) or even the language could be the empowering criteria for the possible tourist on-the-spot. This project has a direct match with the universal tourism proposal, and could be a perfect match but has a more general approach. This concept intends to be a website in which you can find 3D models of digitalized architectural elements as capitels and a database on architecture heritage. The portal would have an in-depth approach to specific content, create a link with Europeana content to enrich architectural heritage research. The capitels can be visualized as they are, giving information on the materials, the date of creation, location (quantitative data), and the portal would focus on adding more information on the iconographic, artistic interpretation and finding the connectors with similar art-works and 3D models. There are two types of “personas” or end users for this concept: the Experts (research & heritage) and the Educators (teachers & students) who would navigate the site by different content. There’s a direct relationship between the needs of specific professionals and museums or institutions, as a Conservator and Restorer role could make certain types of content accessible to a more general public or to educational communities, something that was seen extremely positive. This proposal would engage with young users such as teenagers (age 15) through a gaming experience based on the Mindcraft success. The City Craft would be structured on an open access digital archive (images or plans from Europeana), organized in different levels (gamification), where families could participate by sharing knowledge on specific locations or buildings to create digital reproductions of city heritage. The typology of the buildings could vary from historical sites, social centers, old shops or any other location that could be interesting for the community. The game has a double function: connect individual (inter-generational) testimonies on city heritage to create a fun and engaging way to experience heritage for teenagers, by building it. The digital files created could then be reproduced in lego models, piece by piece.